Retired astronaut Mark Lee will be presenting in person on the Friday of Camp! 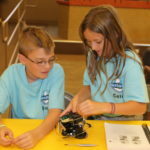 Robotics lab– build robots with a fellow team member! Rocket build– construct a rocket and customize it with a unique paint job. Teambuilding activities throughout the week, each student will be a team leader for a day and learn what it’s like to be a mission commander! STEM Challenges throughout the week, twice daily, in which each student will work with a partner or their team to build, create, and solve the various tasks put before them! History of the space program– from the first astronauts of the Mercury program to those training for the mission to Mars. Guest speakers and presentations on: exploration of other planets in our solar system, health and nutrition in space, current NASA projects and research, engineering, principals of flight, space craft construction, how weather affects space launch conditions, and so much more! Graduation & Party- Friday evening is the graduation ceremony, each student is recognized and presented with a diploma and special lapel pin from retired astronaut Mark Lee, the Sparta Mayor, and the Museum Board President. This is followed by a dinner (or party as the kids call it!) for the students and their families, the space camp instructors, donors of the space camp, and anyone else who has made a contribution to this great Space Camp! *List of activities is subject to change/update without notice.